Delegates from Britain, Europe and South Africa were welcomed to the first event held at The Centre for WW1 Internment. The two day Conference started by exploring Knockaloe’s role at the centre of WW1 Internment, introduced by Professor Panikos Panayi from De Montfort University, academic adviser to the Knockaloe Charitable Trust (“the Charity”) project which has been supported by the AHRC-funded Centre for Hidden Histories (based at the University of Nottingham). Along with Professor Panayi, Charity Director, Alison Jones, introduced the distinguished speakers from both on and off Island. Alison Jones commented ‘We were delighted to be supported by speakers from Britain, Europe and Asia, representing a range of different projects including those Camps whose Civilian Internees were transferred to Knockaloe, as well as speakers focussing on individual internee stories. These speakers teamed up with Island experts across the three days including: Roy Baker, curator of The Leece Museum, Ivor Ramsden, curator of The Manx Military and Aviation Museum, Kerry Kemp, President of The Isle of Man Postal History Society, Cpl Barry Quilliam focussing on the Camp Guard, and Yvonne Cresswell, Social History Curator of MNH. Our thoughts were with Dr Jennifer Kewley Draskau who has supported us from the start but who sadly had to pull out due to personal reasons. 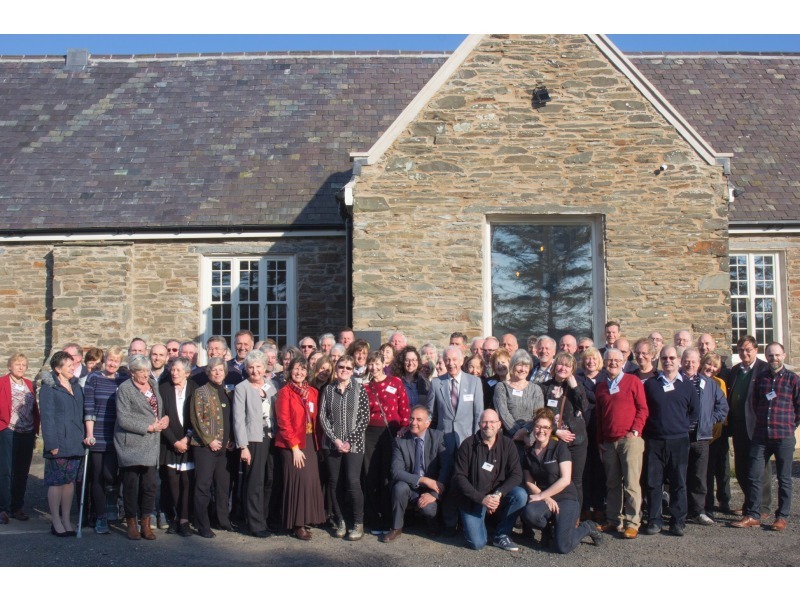 Six years of incredibly hard work associated with The Centre for WW1 Internment (Knockaloe Visitor Centre) and Internee Database, collating and detailing information on the experience of enemy aliens interned in the British Isles, will come to fruition when the Centre opens in early summer. ‘This project has always been about two things: our village and Island community today; and our village and Island community over 100 years ago. We are absolutely delighted that we are able to welcome so many descendants who have travelled from various parts of Europe and even Africa to attend the conference, many of whom who have supported us so much as the project has progressed. Our conference tickets were oversubscribed to descendants on our mailing list within days of their launch. With well over a million internee descendants with a special reason to visit the Island, and its relevance to those with the events surrounding WW1 history we are looking forward to encouraging new visitors to enjoy what our Island has to offer’ said Charity Trustee Alison Jones. The Conference culminated in the unveiling of the sculpture, Spy Fever, a bronze cast of a dress table stool, originally designed 1916/17 by Charles Rennie Mackintosh, and built by German civilian internees at Knockaloe WW1 internment camp on the Isle of Man created by Tom Krasny, Visual Artist, Glasgow School of Art. The piece was generously supported by the Isle of Man Arts Council and DEFA. The Knockaloe Exhibition and Patrick Community Centre project launched its www.knockaloe.im website on the 17th November 2014, 100 years to the day that the first internees moved into Knockaloe. 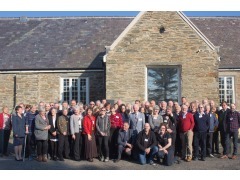 Over its six years of development before and since its launch, a vast amount of work has been undertaken by the community, volunteers and grant/donation funded staff building up to its opening, timed to coincide with the centenary of the end of “Knockaloe Internment Camp” whose final internees only departed during 1919. The Conference made use of the tables and seating kindly funded by the Gough Ritchie Trust who have continually been prepared to support a small community with a vision to preserve a special building for community use, by remembering the experiences of those who were imprisoned in the village over 100 years ago. The Charity is so grateful for the support throughout of the Department of Environment, Food and Agriculture (“DEFA”). With DEFA’s support, the Charity will also be launching a walk up the main drive of the former WW1 Camp, interpreted via an “App” which can be downloaded at the Visitors Centre, and the initial opening of “The Garden of Barbed Wire” on Knockaloe itself. Based in Patrick Village in the west of the Island, the Centre for WW1 Internment provides a future for the former Patrick Village School, directly opposite the entrance to Knockaloe Moar Farm, adjacent to the graves of internees who never left the village. The building itself was the location of many court cases and inquests relating to the Camp just over a century ago. Accommodating 23,000 internees, Knockaloe was the largest internment camp of WW1 by far. Well over 30,000 internees, the vast majority of all of those interned in WW1, spent some or most of their internment at Knockaloe. With Internees initially spending time in a number of camps, or with different family members at different camps, the Knockaloe Database brings together all of these stories in one central location. The Charity has been overwhelmed by the generosity of the archives, collectors and descendants for sharing their information and allowing the Charity to bring the information together in one place. The Centre for WW1 Internment is delighted to be UNESCO Biosphere partner, welcoming and educating visitors to the Island from all over the world with an interest in the Island’s history. In creating the Centre the project also retains its community focus, providing a venue for community and cultural events at Patrick Old School both for community today, as well as a Visitors Centre for the descendants of those who lived in our village 100 years ago, and for all of those interested in this incredible piece of Island history. The Centre for WW1 Internment will be open in early summer and will house a vast array of artefacts. The Exhibition, Database and App tell the incredible story of a great wooden town created in one little Village and the lives of those it impacted over 100 years ago.